O God, who didst give to thy people blessed Bonaventure for a minister of eternal salvation; grant, we beseech thee, that he, who was the instructor of our life here one earth, may in heaven become our intercessor. Through our Lord Jesus Christ, thy Son, who liveth and reigneth with thee, in the unity of the Holy Ghost, God, world without end. Amen. Four months after the Angel of the Schools (St. Thomas Aquinas), the Seraphic Doctor appears in the heavens. Bound by the ties of love when on earth, the two (St. Thomas Aquinas & St. Bonaventure) are now united for ever before the Throne of God. Bonaventure's own words will show us how great a right they both had to the heavenly titles bestowed upon them by the admiring gratitude of men. Such is the teaching of Bonaventure in his book of the Hierarchy, wherein he shows us the secret workings of Eternal Wisdom for the salvation of the world and the sanctification of the elect. It would be impossible to understand aright the history of the thirteenth century, were we to forget the prophetic vision, wherein our Lady was seen presenting to her offended Son His two servants Dominic and Francis, that they might, by their powerful union, bring back to Him the wandering human race. What a spectacle for Angels when, on the morrow of the apparition, the two saints met and embraced: “Thou art my companion, we will run side by side,” said the descendant of the Gusmans (St. Dominic) to the poor man of Assisi (St. Francis); “let us keep together, and no man will be able to prevail against us.” These words might well have been the motto of their noble sons, Thomas and Bonaventure. The star which shone over the head of St. Dominic, shed its bright rays on Thomas (Aquinas); the Seraph who imprinted the stigmata in the flesh of St. Francis, touched with his fiery wing the soul of Bonaventure; yet both, like their incomparable fathers, had but one end in view: to draw men by science and love to that eternal life which consists in knowing the only true God and Jesus Christ whom He has sent. Both were burning and shining lamps, blending their flames in the heavens, in proportions which no mortal eye could distinguish here below; nevertheless, Eternal Wisdom has willed that the Church on earth should borrow more especially light from Thomas (Aquinas) and fire from Bonaventure. Would that we might here show in each of them the workings of Wisdom, the one bond even on earth of their union of thoughts,—that Wisdom, who, ever unchangeable in her adorable unity, never repeats herself in the souls she chooses from among the nations to become the prophets and the friends of God. But to-day we must speak only of Bonaventure. When quite a child, he was saved by St. Francis from imminent death; whereupon his pious mother offered him by vow to the Saint, promising that he should enter the Order of Friars Minor. Thus, in the likeness of holy poverty, that beloved companion of the Seraphic Patriarch, did Eternal Wisdom prevent our Saint from his very cradle, showing herself first unto him. At the earliest awakening of his faculties he found her seated at the entrance of his soul, awaiting the opening of its gates, which are, he tells us, intelligence and love. Having received a good soul in an undefiled body, he preferred Wisdom before kingdoms and thrones, and esteemed riches nothing in comparison with the august friend, who offered herself to him in the glory of her nobility and beauty. From that first moment, without ever waning, she was his light. Peacefully as a sunbeam glancing through a hitherto closed window, Wisdom filled this dwelling, now become her own, as the bride on the nuptial day takes possession of the bridegroom's house, filling it with joy, in community of goods, and above all of love. Such indeed is the object of those Commentaries on the four Books of Sentences, first delivered as lectures from the chair of Paris, where he held the noblest intellects spell-bound by his graceful and inspired language. This masterpiece, while it is an inexhaustible mine of treasures to the Franciscan family, bears so great testimony to the science of this doctor of twenty-seven years of age, that, though so soon called from his chair to the government of a great Order, he was worthy on account of this single work to share with his friend Thomas of Aquin, who was fortunately freer to pursue his studies, the honourable title of prince of Sacred Theology. But the time had come when obedience was to give place to another kind of merit, less pleasing to himself, but not less profitable to the brethren. At thirty-five years of age, he was elected Minister General. Obliged thus to quit the field of scholastic teaching, he entrusted it to his friend, Thomas of Aquin, who, younger by several years, was to cultivate it longer and more completely than he himself had been suffered. The Church would lose nothing by the change; for, Eternal Wisdom, who ordereth all things with strength and sweetness, thus disposed that these two incomparable geniuses, completing one another, should give us the fulness of that true science which not only reveals God, but leads to Him. The dignity mentioned by the faithful secretary is that of Cardinal Bishop of Albano. 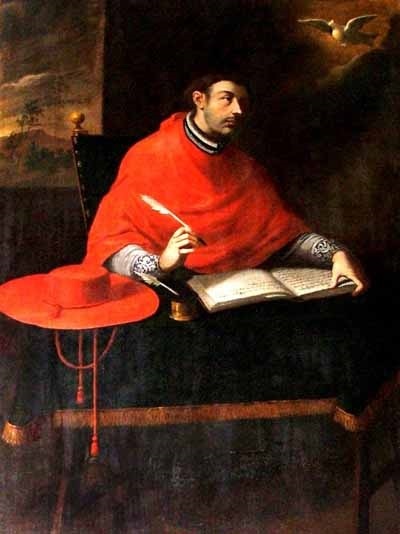 After the death of Clement IV, and the succeeding three years of widowhood for the Church, our Saint, by his influence with the Sacred College, had obtained the election of Gregory X, who now imposed upon him in virtue of obedience the honour of the Cardinalate. Having been entrusted with the work of preparation for the Council of Lyons, convened for the Spring of 1274, Bonaventure had the joy of assisting at the re-union of the Latin and Greek Churches, which he, more than anyone else, had been instrumental in obtaining. But God spared him the bitterness of seeing how short-lived the re-union was to be: a union which would have been the salvation of that East which he loved, and where his name, translated into Eutychius, was still in veneration two centuries later at the time of the Council of Florence. On the 15th of July of that year, 1274, in the midst of the Council, and presided at by the Sovereign Pontiff himself, took place the most solemn funeral the world has ever witnessed. “I grieve for thee, my brother Jonathan,” cried out before that mourning assembly gathered from East and West, the Dominican Cardinal Peter of Tarentaise. After fifty-three years spent in this world, the Seraph had cast off his robe of flesh, and spreading his wings had gone to join Thomas of Aquin, who had by a very short time preceded him to heaven. There are only two proper lessons consecrated to St. Bonaventure, but the elegant conciseness with which much is said in few words somewhat compensates for their shortness. Bonaventure was born at Bagnorea, in Tuscany. During his childhood his life was once endangered, and his mother vowed that if her son survived she would consecrate him to God in the Order of Blessed Francis. On this account, while still a youth, Bonaventure begged to be admitted among the Friars Minors. He had for master Alexander Hales, and became in a short time so eminent in learning that at the end of seven years he publicly, in Paris, explained the books of the Sentences, with great applause. Later on he published also excellent commentaries on the same book. After the lapse of six years, he was elected Minister General of his Order, at Rome, and he became the object of universal praise and admiration by the prudence and sanctity he displayed in the fulfilment of this office. He wrote many works which, combining the greatest learning with the most ardent piety, at once instruct and move the reader. Urged by the renown of his sanctity and wisdom, Gregory X made him Cardinal Bishop of Albano. He was, while still living, called a Saint by Blessed Thomas of Aqnin, who, finding him one day writing the life of St. Francis, said: “Let us allow one saint to labour for another.” Bonaventure departed this life on the day before the Ides of July, at the Council of Lyons, being fifty-three years of age. He performed many miracles, and was added to the number of the saints by the Sovereign Pontiff, Sixtus IV. Anth. O excellent Doctor, light of the holy Church, blessed Bonaventure, lover of the divine law, pray to the Son of God for us.